We've compiled a list of the 6 Hotel Card Deals currently available on CreditDonkey. Hotel rewards credit cards typically offer generous sign-up bonuses toward free nights. Look for additional perks, like 1:1 point transfer to frequent flyer programs and unrestricted point redemption. Check out the selection of cards below to find one that fits your lifestyle. If you frequently stay at a certain chain of hotels, such as Hilton or Marriott, then consider signing up for a hotel-branded credit card that gives you extra discounts with that hotel chain. If you don’t have brand loyalty to a particular chain, consider a flexible travel rewards card (such as Chase Sapphire Preferred or Capital One Venture) that lets you redeem points for hotel stays, airline tickets and other rewards. If you don’t travel often, a card that gives you cash back for your purchases might be your best bet. While most premium credit cards do have an annual fee, don't let that deter you. For frequent travelers, the credit cards with an annual fee come with the most generous introductory deal, which often will far exceed the cost of the annual fee. As with any card, be sure to see whether the APR, annual fee and other benefits are a good fit for you. For rates and fees of the American Express Hilton card, please click here. Hotel Rewards: Earn 7X Hilton Honors Bonus Points for each dollar of eligible purchases charged directly with a hotel or resort within the Hilton Honors portfolio of brands. Introductory Bonus Hotel Rewards: Earn 75,000 Hilton Honors Bonus Points with the Hilton Honors American Express Card after you use your new Card to make $1,000 in eligible purchases within the first 3 months of Card Membership. Hilton Honors: Enjoy complimentary Hilton Honors Silver status with your Card. Plus, spend $20,000 on eligible purchases on your Card in a calendar year and you can earn an upgrade to Hilton Honors Gold status through the end of the next calendar year. Hotel Rewards: Earn 12X Hilton Honors Bonus Points for each dollar of eligible purchases charged on your Card directly with a hotel or resort within the Hilton Portfolio. Introductory Bonus Hotel Rewards: Earn 125,000 Hilton Honors Bonus Points with the Hilton Honors American Express Ascend Card after you use your new Card to make $2,000 in eligible purchases within the first 3 months of Card Membership. Bonus Hotel Rewards: Earn a Weekend Night Reward from Hilton Honors after you spend $15,000 on purchases on your Card in a calendar year. Hilton Honors American Express Aspire Card offers 150,000 Bonus Points after you spend $4,000 on purchases within the first 3 months of opening your new card account. You earn a Weekend Night Reward with your new card and every year after renewal. Plus, you earn an additional night after you spend $60,000 on purchases on your card in a calendar year. You earn 14X Hilton Honors Bonus Points for each dollar of eligible purchases spent directly at a hotel or resort within the Hilton Portfolio. You earn 7X Hilton Honors Bonus Points for each dollar of eligible purchases for flights booked directly with airlines or amextravel.com, car rentals booked directly with select car rental companies, and U.S. restaurants. For all other eligible purchases, you earn 3X Hilton Honors Bonus Points. You enjoy complimentary Hilton Honors Diamond Status. You also enjoy up to $250 in statement credit each year for eligible purchases at participating Hilton Resorts. There is a $450 annual fee. Terms apply. Hotel Rewards: 5X Membership Rewards points on prepaid hotels booked on amextravel.com. Disclaimer: The information for the Hilton Honors American Express Aspire Card and Citi Prestige® Card has been collected independently by CreditDonkey. The card details on this page have not been reviewed or provided by the card issuer. Rewards credit cards are becoming increasing popular for a good reason. Each time you use your rewards credit card, you’re accumulating points that can be used for cash back, merchandise, gift cards and, in some instances, hotel rooms. Consumers who travel frequently can use their rewards credit card to rack up points toward future travels. The cards can typically be used at any merchant who accepts credit cards, with additional points being accrued when used at hotels. While hotel rewards cards offer great benefits, consumers typically assume the rewards can only be utilized for future hotel stays. However, there typically are quite a few other benefits that cardholders receive with a hotel rewards credit card. In fact, here are three of the lesser known benefits that truly make hotel rewards worth using. The focus of hotel cards is definitely on hotel rewards. But did you realize that these rewards aren’t just for future stays? You can also utilize your perks to upgrade hotel rooms that you booked regularly through your credit card. Many hotels also have other perks that your card will get you, such as credits for the hotel restaurant or access to the special concierge floor. If you’re uncertain what perks your card will get you at your preferred hotel, all you have to do is ask. The attendants at the front desk should be able to fill you in on the details. If you have a hotel card that isn’t tied to a specific hotel, you may also want to check directly with your credit card program so you are well versed on the hotel benefits and to see if they differ with each hotel brand. If you want to focus on airline mile rewards, then an airline credit card is probably best for you. But did you know that many hotel rewards cards enable you to use your rewards toward airline miles as well? Sometimes consumers can actually get a special offer when they utilize their hotel rewards card to book a flight. When booking through your rewards program, you may score a better deal than if you went directly through the airline’s website. You’ll want to research your options to see which is currently offering the better value to ensure you’re getting the biggest bang for your rewards. Hotel rewards cards typically include other fantastic travel benefits including special insurance and protections. This may include hotel theft insurance, trip cancellation protection and rental car insurance -- check with your credit card issuer. Trip cancellation protection – if you have booked rooms, reserved a rental car and made other special arrangements, it can be expensive to cancel your trip at the last minute; this protection can help you decrease those costs through reimbursement. Rental car insurance – if you have ever rented a car, you know that the rental car insurance can add hundreds onto the price of the rental. Many credit cards include rental car insurance as a perk, so you can use that extra money on something a little more fun. Between renting a room, booking a flight, and finding a rental car, your vacation budget could be completely wiped out before you even get to your destination and pay your hotel bill. Luckily, there are ways to save money on the room you book. 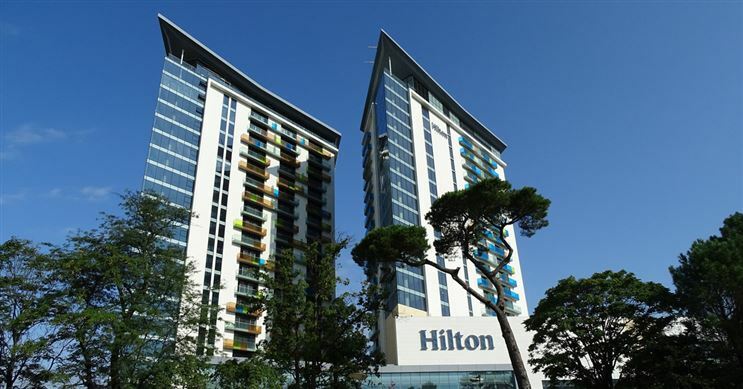 Are you a fan of Hilton hotels? There are a few Hilton credit cards that make it easier to rack up points for reward nights. See which one is good for you. Kick back and relax for some fun facts about the hotel industry and the people who work in it. The answer to #23 will probably be a complete shock!